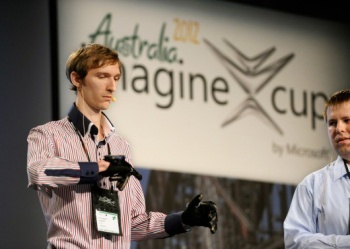 You might soon talk with your hands, thanks to the winner of the Microsoft Imagine Cup 2012. Remember that 1995 movie Congo with the gorilla that could talk using sign language and a voice modulator? Well, it only took about 20 years, but the technology to make such a device real finally caught up to campy Hollywood films. At Microsoft's annual design competition called the Imagine Cup, a group from the Ukraine won the Software Design category for EnableTalk. In truth, the pair of gloves covered in sensors wouldn't have done much without the software to translate hand movements to something a computer could understand, and then communicate with Microsoft's voice programming API to export actual speech. That all of that happens in real time using simple hardware is pretty amazing, and EnableTalk earned the Ukrainian Quadsquad team $25,000. The four members of Quadsquad (get it?) got the idea to make these gloves when they tried to interact with deaf classmates at their school. The team spent time building the prototype using custom made flex sensors, touch sensors, gyroscopes and accelerometers to gather as much data from the hand motions as possible. Transmitting that data via Bluetooth to a Windows Mobile-powered cellphone was just a stroke of genius. Now that EnableTalk won the prize, the group will now turn to trying to sell the glove and software combo. The prototype's materials only cost around $75, and the group plans to sell the unit for $200 each. That might sound like a huge markup, but similar products (using less sensors, a wired connection, with no integrated voice support) cost about $1,200. The applications for EnableTalk are plentiful. Hearing impaired and deaf people could use them to converse with people who don't know sign language, allowing them to lead more normal lives. Severely autistic or handicapped patients could use them to speak to loved ones. We could even go full circle and use these gloves to communicate with animals. Somebody call Bruce Campbell, it's time for Congo 2. Amy. Good girl.